I had never eaten Peruvian food before; I was familiar with Brazilian and Argentinian cuisine, but Peruvian had slipped by me. The Brit gave me an opportunity to change that recently. We loved it so much we returned a few weeks later. The first time we sat inside the gorgeous restaurant, with its modern lines, warm woods, bright blues, and a backdrop of creams. 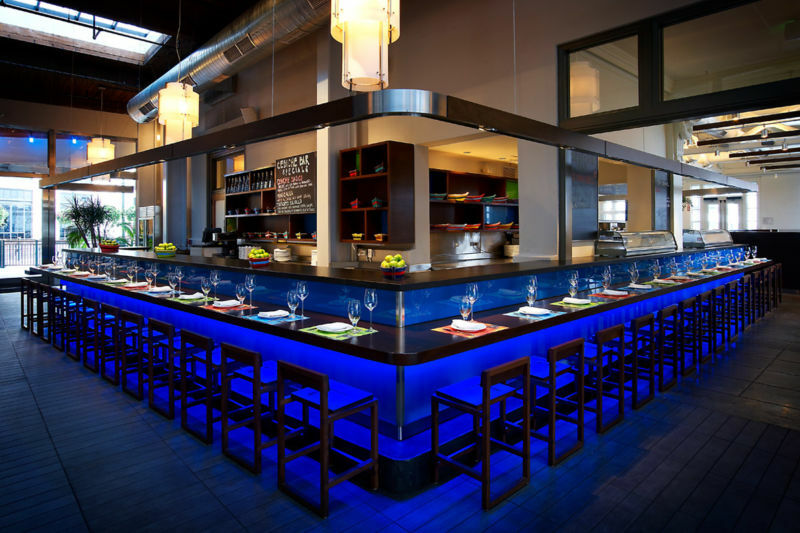 The mats on the tables are brightly colored and everything feels stylish without being uncomfortably formal. On our second visit, we sat on the patio overlooking the water and the boats. 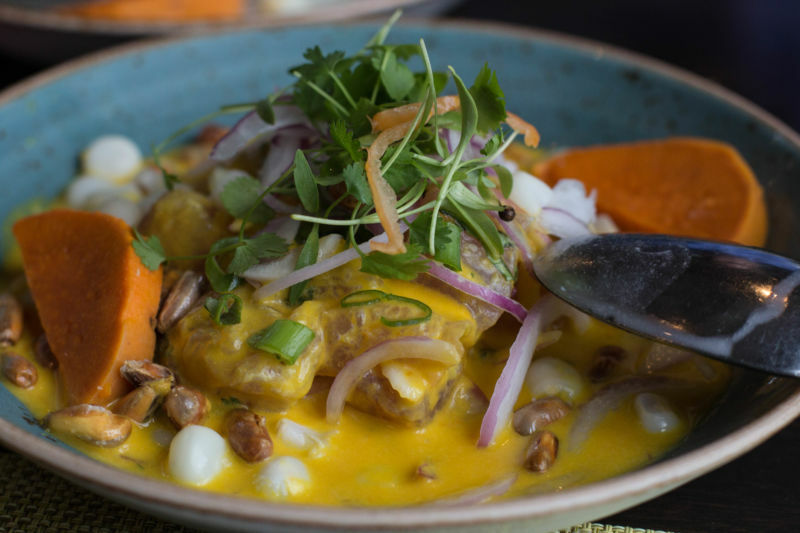 The Brit comments: I too had no experience of Peruvian cooking until this year when I tried it from several of the food trucks, about which I have previously written. Finding a more upscale place so close to the ferry that allowed further exploration of this country’s cuisine seemed an opportunity worth seizing. 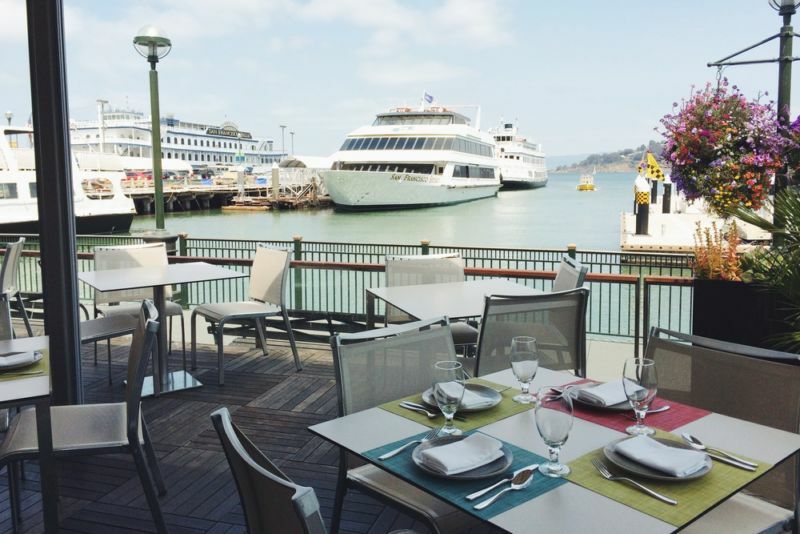 La Mar is located on the Embarcadero in downtown San Francisco. It is only a short walk from the Ferry Building. They serve mostly fish, as the name suggests, but their meat and chicken dishes are just as delicious. The Brit comments: The restaurant offers an extensive wine and cocktail list. The former menu show a heavy bias towards Spanish, Chilean, and Argentinian wines. On my first visit, I drank one of their Pisco based cocktails. Pisco is a type of brandy that is the national drink of Peru. On the second trip I had a glass of their Argentinian Torrontés; the second time that I have tried a wine of this variety. The waitstaff were more than pleasant as they served us and we felt well attended to. 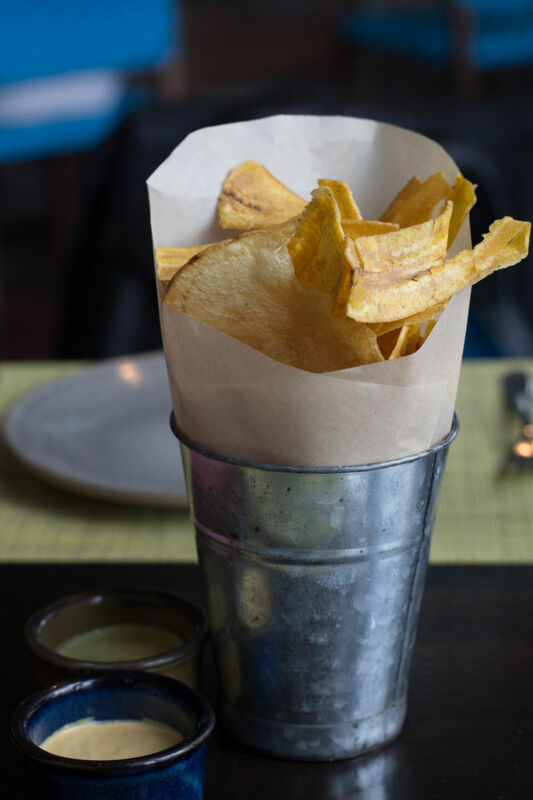 Upon asking for our drink orders, we were presented with a cup chocked full of fried plantains and potato chips. They were served slightly salted with a wonderful spicy sauce on the side. We couldn’t stop eating them and went through several refills. The first time we went all three of us were fish eaters; so we started with two types of cerbiche. We shared the Classico and the La Mar; both were outstanding. I think my favorite was the Classico, with its mild fish, big slices of sweet potato, onion, and the bright sharp flavor of lime to really make the dish pop. 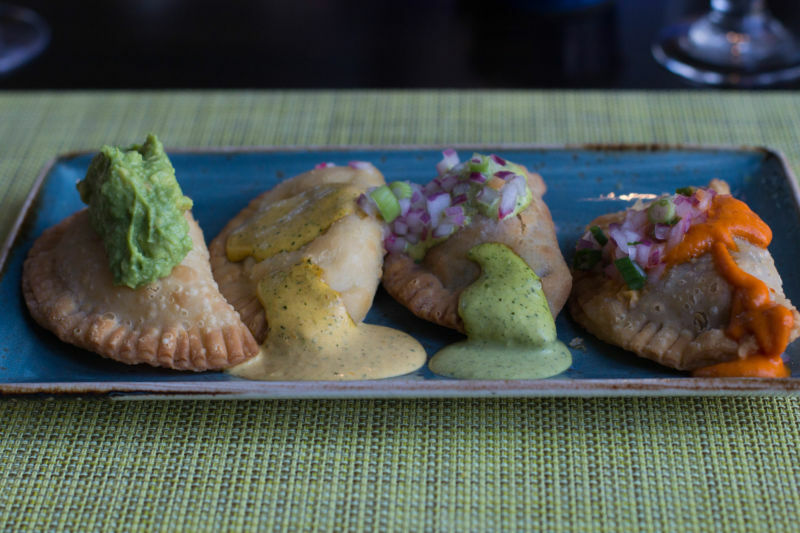 For my main course as I was not accustomed to the dishes on the menu, I ordered the four empanadas. They were absolutely delicious; each one had a unique flavor. The Brit of course knew what he was doing and ordered the Lomo Saltado, which is a dish of tender beef strips in dish of tomatoes and onions. 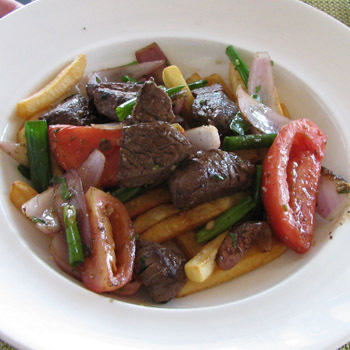 The Brit comments: I appreciate California Girl making me sound like an expert, but Lomo Saltado is the only Peruvian dish with which I had familiarity; as it is the staple of the aforementioned food trucks. I am glad to report that this expression of the dish was even better than those trucks had provided. On our second trip we were with two other ladies, one who really doesn’t eat fish. She declined our first dish which was a nest of puréed purple potato with crab and a quails egg; it was outstanding. I would have never put those ingredients together, but wow, it really worked! The Brit comments: I do not like egg, so I requested that the quail egg be served on the side. 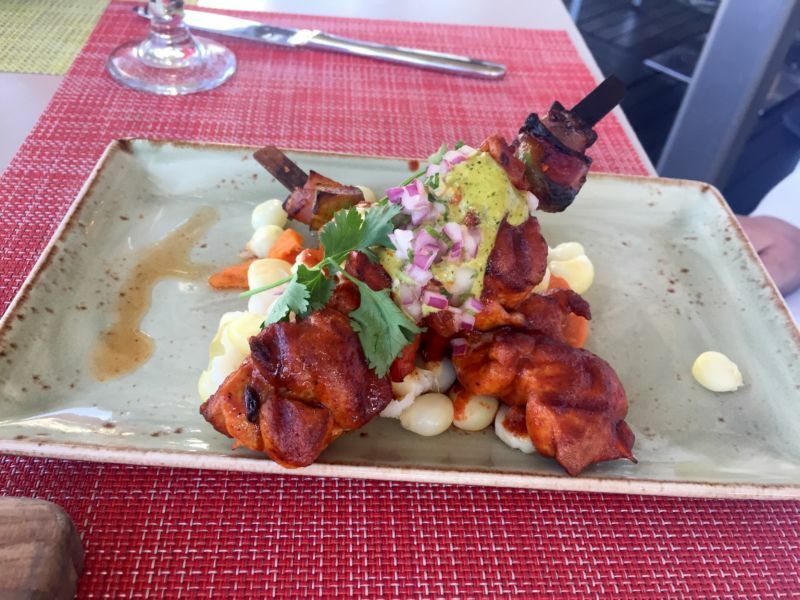 I had a gorgeous dish of skewered chicken on my second visit. Wow, it was amazing. It was cooked perfectly, tender and juicy. Congratulations to the chefs there; it was outstanding! (This is the first “outstanding” I have given to a chicken dish on this blog – that says something.) The skewers were marinated chicken, onions, and peppers. 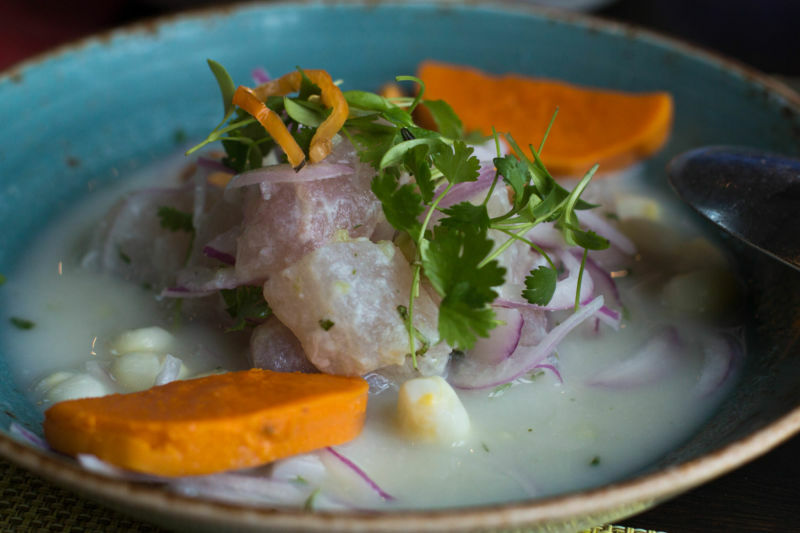 It was garnished with hominy, cilantro, sweet potato, and red onion. It had a drizzle of hucatay cream. The Brit had what was described on the menu as tuna belly. He is a tuna lover, particularly raw or rare. When the tuna arrived all of our table just stared at it in amazement. The photo does not show how huge this dish was. Three people could have eaten this comfortably with leftovers. The flavor was simply delicious. 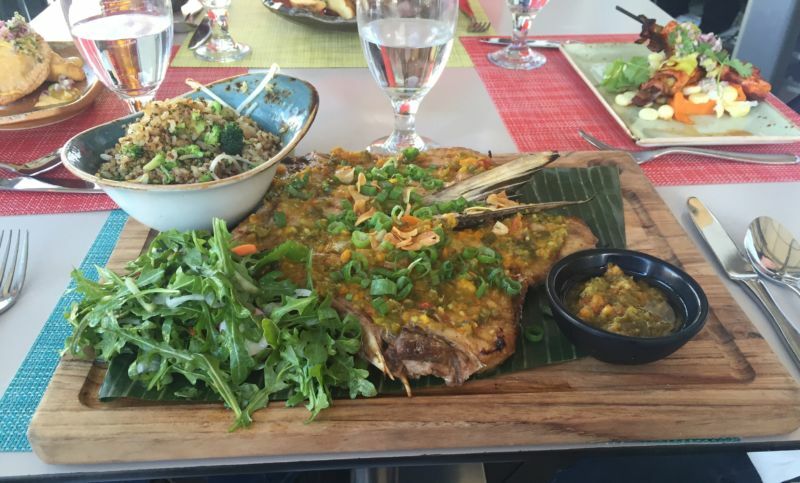 I was so overwhelmed with his dish that I didn’t stop to jot down notes on its composition. I have never had fish like this before. Even our non-fish eater ate some and loved it. We all raved too about the accompanying rice dish that had bean sprouts, quinoa, broccoli, and red peppers in it. We could have eaten that rice on its own. The leftovers for the meal were packed up and it will make a great dinner for me and The Brit. The Brit comments: Tuna is usually a dish with a small amount of fish. If I had seen this plate before ordering, I would probably have avoided it. In this case ignorance was bliss. The flavour of every part of the meal was a delight. There was a corn pudding side, which sounded on the menu as though it would be bland; it was a wonderful mix of balanced spices, textural richness, and a complement to the fish and the rice. Unfortunately, it was a special, so I may not be able to eat this on future visits. After our main courses all of us were stuffed, but we had an hour until our ferry. Even though none of us really wanted dessert, we decided to look at the menu anyway. That was our downfall. 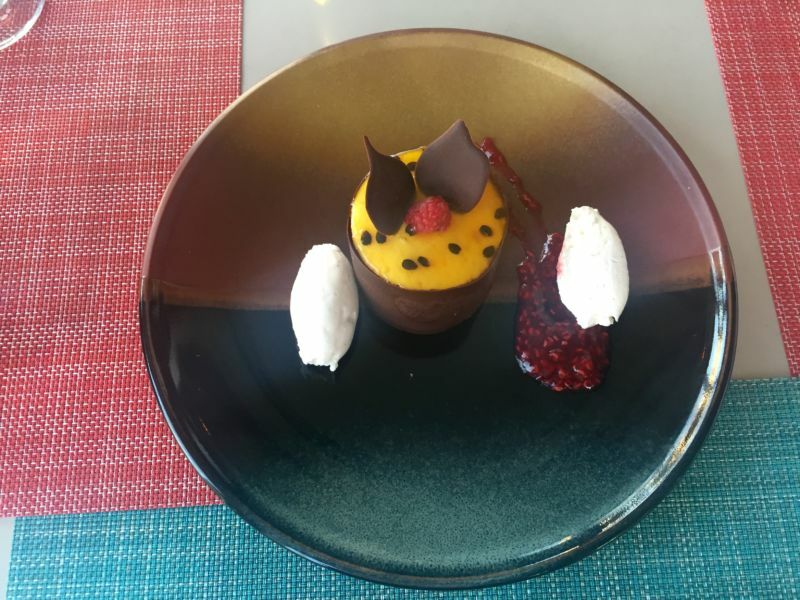 One of our guests actually squealed in delight when she saw one of the menu items: a passion fruit mousse with a dark chocolate mousse and raspberry coulis on a hazelnut praline crust. We all ate that dessert and it was beyond heavenly. Tart, fresh, rich, and fruity all together with the silky chocolate and crunch of the praline crust. It was one of the most innovative desserts I have ever eaten. I loved the combination. The Brit comments: This wonderful dessert is called choco—maracuya; it is worth visiting La Mar for this alone. 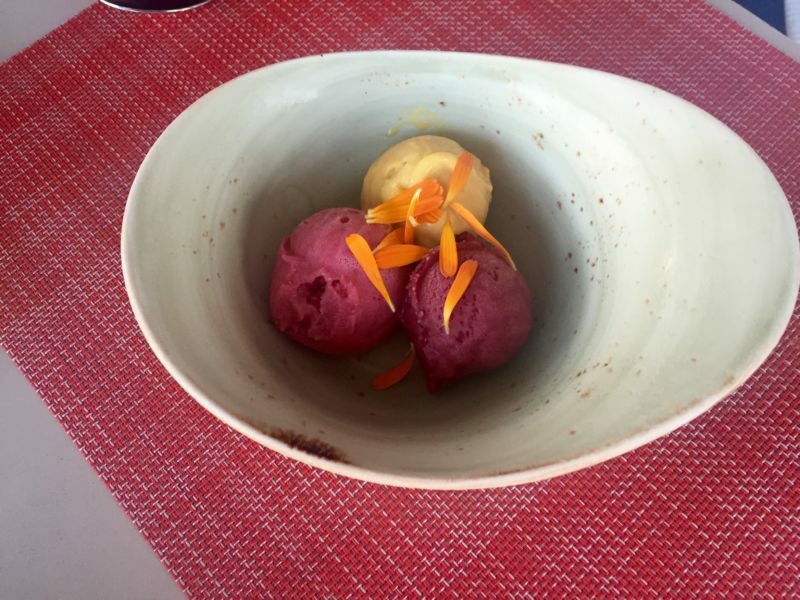 The Brit always orders sorbet or ice cream. They had a selection of three on the menu: mixed berry, passion fruit, and berry and spice combination. For me, hands down, it was the berry and spice combination that won. Cinnamon, cloves, and allspice notes mixed with the beautiful berry flavor just did it for me. The passion fruit was creamy and tart, and the mixed berry was good too, but it was the berry and spice that won our hearts. The Brit comments: I think on balance that California Girl is right in her pick, but selecting a favorite from these three sorbets is a hard task; further research may be needed. I would highly recommend this restaurant for a date night, a working lunch, or a night with friends. I wouldn’t call this a family friendly place so it is probably best to leave the little ones at home. The Brit comments: Working in a city with such a diverse range of restaurants means that revisiting any one place feels like an opportunity lost, but the variety and quality of the food at La Mar makes a third meal extremely tempting.